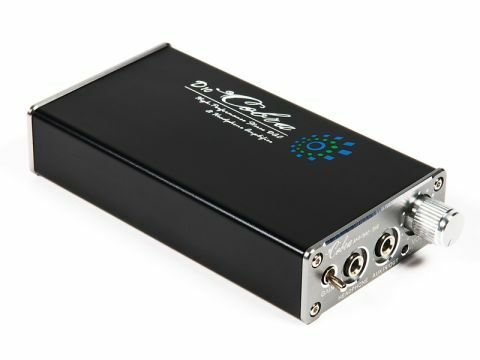 The iBasso D10 Cobra is more than just a headphone amp, it's also a three-input DAC. Miniaturisation is a wonderful thing and despite this unit's diminutive dimensions of 55mm wide by 21mm high by 104mm deep, it includes both optical and electrical S/PDIF inputs and a USB socket for connection to most flavours of portable or desktop computer. Oh, and because it's portable there's a battery in there, plus enough circuitry to charge it from the USB connection (for those without a handy computer, iBasso provides a plug-in charger and USB-type lead). Too bad so few iThings have any kind of digital output. That's already a decent feature list, but iBasso has really gone all the way for the tweaker and made it possible to change the op-amps in the output circuit so as to personalise the sound to some extent. The fitted op-amp is a perfectly respectable type, but a couple of higher performance ones are provided – surface-mount devices, mounted on adaptors to allow them to be easily plugged in. A pair of blank adaptors are provided, too, and you could, in principle, use almost any through-hole mounting op-amp with an industry-standard pin-out. Operation is simple, though it can seem a little confusing that the 'Aux' socket on the front is both an input (when using the D10 as an amplifier) and an output (when using it as a DAC). The volume control includes the on/off switch and it seems pretty hard to turn on by accident. Battery life in DAC mode is about 20 hours or 30 in amp mode.